My work and research for the past fifteen years has been focused on exploring the genre of still-life as a multifaceted and complex response to the history of art. The breadth of my work within the context of photography and digital media interprets the still-life through a variety of processes ranging from the latest digital technology to the use of the most fundamental photographic element: the pinhole camera. While much of my work explores color relationships in addition to symbolism and the suggestion of narrative, I also explore traditional photographic methods such as creating works on metal (tintypes) and traditional hand applied emulsions including the historic Kallitype and platinum printing processes used in the late 1800's. Much of my earlier work focused on scanning objects into a computer and printing the image out either as a color inkjet print or as a black and white negative on transparency material for use in a traditional darkroom environment. 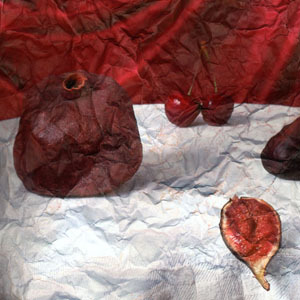 My newer works employ the use of a digital camera to create an image of an arrangement of elements concentrating on traditional compositional strategies often used in the Dutch tradition of still-life painting. These images are then printed through an inkjet printer and then set aside for weeks and months. I then take the pages, that over time have been subjected to physical abuse, and scan the image into a computer thus adding another interpretive element to both the medium of photography and the subject of still-life. I have made both large and small scale prints of these newer still-lifes and find that while the large scale images lend gravitas to the everyday objects pictured, the small scale prints offer a sense of intimacy and eloquence to the viewing experience. The genre of still-life was considered the lowest form of fine art, behind religious, history, portraiture and landscape painting. After photography's inception into the public in the late 1830's, still-life was one of the first subjects photographers investigated, in large part due to the slow nature of photographic processes, which required artists to photograph stationary elements. I am deeply aware of the importance that still-life has played in the history of photography and recently I have begun to create photographs that are one half of a conversation with the work of early photographers such asHenry Fox Talbot and Roger Fenton, the former's work being austerely spare while the latter's mimicked still-life in the Dutch tradition. Ultimately the goal of my proposed series of still-life's is to reinvent and reinvestigate the genre.